. . . Hundreds of newspapers printed his latest quotes and described the way he parted his hair, his fondness for cigars. In New York, a doctor used extracts of Prejudices to test his patients’ vision. Beauties of the Ziegfeld Follies held copies of Prejudices while hanging out at the Algonquin Hotel. . . . F. Scott Fitzgerald inserted Mencken’s name in the proofs of This Side of Paradise. His dalliances with blondes inspired Anita Loos to write Gentlemen Prefer Blondes. Journalists, motivated by his outspoken stands on controversial issues, imitated his vernacular style. His popularity gave Mencken a freedom to write on subjects nobody else would cover. His writings during and after World War I supported woman suffrage, promoted African American authors, and championed the contributions of immigrants to American society. He inveighed against censorship, corruption, police brutality, the Ku Klux Klan, and (above all) Prohibition. In fact, as Rodgers points out in her biography, Mencken wrote at least forty-two newspaper columns about the ban on alcohol. Liberty, if it means anything at all, means that body of rights which the citizen reserves to himself, even as against the government. . . . Thus a conflict is set up between the rights of the citizen and the power and security of the government. In so far as the citizen prevails the government is weak, and in so far as the government prevails the citizen is not a citizen at all, but a subject. Obviously no government, of its own motion, will increase its own weakness, for that would mean to acquiesce in its own destruction. . . . So governments, whatever their pretensions otherwise, try to preserve themselves by holding the individual down. 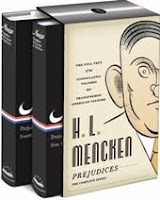 In the following satire, Mencken adopts an entirely different approach to the same topic, employing his trademark sarcasm to lampoon those (like himself) who defend the Bill of Rights and to assail those who would dispense with those rights “to safeguard public order and the public security.” We present this week’s selection both to honor Mencken Day (celebrated each year in Baltimore on the Saturday before his birthday, September 12) and to celebrate the publication of The Library of America edition of the complete Prejudices. Notes to page 413: Mooney is a reference to Thomas Mooney, a labor leader convicted of murder in 1916 and pardoned in 1939. Also see Wikipedia for information on the trial of Sacco and Vanzetti. Every time an officer of the constabulary, in the execution of his just and awful powers under American law, produces a compound fracture of the occiput of some citizen in his custody, with hemorrhage, shock, coma and death, there comes a feeble, falsetto protest from specialists in human liberty. . . . If you don't see the full selection below, click here (PDF) or click here (Google Docs) to read it—free! We need Menken now to put the growing Boobacracy in its place. What a timely piece! He shows us the kind of life the Tea Party and other right-wing groups would have! If you read Mencken's writings , you will find he is pretty right wing. He detested people like Teddy Roosevelt and the progressives. He liked Nietzsche also. I don't think he would be a friend of the left. He had a quote that went something like, "The gov't is the enemy of superior men." One can only wonder why is the satirical nature of this piece is lost on the prior commentators. Can it be the booboisie rearing its head, perhaps? Mencken has a superb succinct definition of democracy: "the theory that the people get the government they deserve, and that they deserve to get it good and hard." This writer, like Nietzsche, is, unassailably, a-political.